In this Things 3 review, I reveal why I think it’s the best standalone productivity app I’ve ever used. Things 3 for Mac, iPad and iPhone (affiliate links) could very well be the best productivity app for you – if (and only if) you’re embedded in the Apple ecosystem. For this Things 3 review, I spent the past month with the app on all three platforms, and I’ve come away very, very impressed. IMO, it’s the best Apple task manager, the best task manager for iPhone/iPad, and the best standalone productivity app I’ve ever used. And I’ve used a lot! Disclosure: this Things 3 review is based on a free sample of the product. If you know me for my ergonomics writings, then you’ll know that I have tried out most ergonomic devices, at one time or another. The same is true with productivity: I’ve used most note taking and task management apps that are out there. I’m always going on about Evernote and have used everything from Outlook tasks, to my email inbox, as a task list of sorts. Following the impending demise of Wunderlist, my most recent foray led me to Nozbe. However, despite the plethora of apps available, it’s surprising how many of them fall short on fairly basic details. Some tasks and projects have a hard deadline. This must be met, or there will be negative consequences. But the majority of the time, we simply want a reminder so things don’t slip through the cracks. Sometimes, all we need is a start date to set us going on a task, at the right time. Nozbe, in common with the majority of apps of this nature, gives you one date field. But this is of the hard deadline variety. Unless you rigorously review all your tasks every day, you feel forced to enter dates onto many tasks, simply as a reminder. The problem is that Nozbe automatically stars tasks that are due today. The starred task list effectively tells you what you’re doing “now”. Unfortunately, this means my daily list gets filled up with an overwhelming set of tasks on most days. On top of that, I get phone notifications telling me how many tasks I need to do. All this puts me off actually doing any of them! To be fair, I’m being a bit harsh on Nozbe. It’s actually a great task manager and it works very well for teams, something that Things 3 struggles with. However, this feeling of overwhelm is common to many task managers, once the number of to dos in the app exceed a certain number. How big that number is varies a lot, depending on how well the user interface is designed. Most apps manage well while you’re adding your first few tasks, but very soon the rot sets in. Thankfully, beautiful, clean design is something that Things 3 has in spades. From my daily usage over the past few weeks, I think they may have finally cracked it: no overwhelm in sight. It’s unusual to mention design in an app review these days. We’re so used to our iPhones and tablets, that we don’t give it a second thought. However, I feel that Things 3 breaks the mould in this respect, so successfully that my review needs to start here. The design of Things 3 is amazingly simple, yet hides a wealth of options and features. And that’s true on all three platforms. On iOS, the developers at Cultured Code have managed to make the experience both beautiful and intuitive. And that’s despite having separate apps for iPhone and iPad. (You read that right: they don’t have a universal iOS app). It’s the same experience on Mac. With the exception of some keyboard shortcuts, everything you can do on iOS is faithfully reproduced, but with an eye to utilising the power of a desktop. I would like to have seen settings to change some of the shortcuts. But there’s no denying that they’ve done an amazing job: moving from one device to another is almost completely seamless. Things 3 offers lots of white space, so it’s always easy on the eyes. When entering and editing tasks, it’s about as close to the experience of writing on a piece of paper, as it’s possible to get in an app. Some people might prefer to have the option of a dark mode, with white text on black, but this suits me perfectly. Even entering a checklist inside a task, feels quick and painless. But I’m getting ahead of myself. Full drag and drop is available on all the apps. Where it’s limited by iOS (iPhone has no folder pane, due to screen space), you can swipe a task right to left, then select the Move option. Adding new tasks is even easier on iOS, due to the “Magic Plus” button, situated in the bottom right corner of the screen. Simply tap it to add a task to the current list. On the main screen, you’ll be presented with a contextual menu instead. This allows you to add a task, new Area or Project. place a task precisely within an ordered list of tasks, say within a project. pop a task quickly into the Inbox. Drag it over to the bottom left of the screen and the Inbox icon will appear, so you don’t even have to change your view. This may sound like a marketing gimmick, but having used it for the last month, I’ve found it really does add to the experience. We’re starting to get into functionality here, rather than design. However, in Things 3, the two are so intrinsically intertwined that it’s difficult to prise them apart. These paradigms are kept consistent throughout the app, so it’s difficult to get lost or lose track of what you’re doing. Of course, adding tasks to an app is all well and good, but having one long list is a recipe for procrastination. You need a way to split them up into smaller, more manageable chunks. There is also a Trash list. In my travels so far, it only became visible on the Mac app once items had been deleted. Trash doesn’t appear to be visible on iPhone. To be honest, I probably wouldn’t want to see it there, anyway. The Inbox is just a holding area for any new task, when you’re not sure what to do with it. This is a well known concept to those of us who practice the Getting Things Done (aka GTD) methodology (here’s the book). The idea is that you could get the inspiration for a new task, at any time or in any place. You might also get several tasks come to mind, all at once. When this happens, you don’t want to mess about trying to decide where to put a task: you just want to get it out of your head. In Things 3, tasks will usually be added to whichever list or project you happen to be viewing. However, you can quickly switch to the inbox and add your new task. Then you switch back to your previous view to carry on working. This is one area where the Magic Plus button on the iOS apps is actually better than the Mac equivalent. Later you’ll revisit the inbox. Then you’ll decide which list to move the task to, and when you might like to do it. This may sound like a strange idea, but I know from many years of practice, that it works well. Getting “stuff” out of your head means you won’t forget anything, and you’ll still be able to concentrate on the tasks at hand. The main view to get your tasks done is the Today screen. Again, it’s lovely and clean, and easy to use. When you first go into the Today view on a given day, the app tells you how many new tasks you have and helpfully highlights them. You can then decide to simply accept them all, by pressing OK.
Alternatively, you can defer or otherwise update individual tasks, before you settle in to your work. Another option allows you to defer a task to the evening, or pick a different date. Evening tasks are displayed in the Today view, but below the main task list. This is a great touch. It’s the first task manager I’ve encountered where thought has been given to the process of working with your tasks. Hopefully, it’s something that Cultured Code will add to, in future iterations. I’d love to see something to support a weekly and quarterly Things 3 review. After the Today view, Upcoming is probably the one I use most, and is rapidly becoming part of my weekly review. Here, you can see any tasks with a date on them, arranged in chronological order. This view could quickly become overwhelming, but once again, the design of Things 3 comes to the rescue. Dates in the coming week are shown individually, with the relevant tasks scheduled for each. You’ll also see any repeating tasks you’ve set up. The date number is shown in large, bold text, with a handy prompt next to it, such as “Tomorrow”, or “Sunday”. Days without tasks are still shown, but with just the right amount of white space. Therefore, you can see at a glance the general landscape of your week and which days are busiest. Beyond these first few days, you’ll see summaries of the following weeks. If you scroll down far enough, you’ll see monthly summaries, instead. The genius of the Upcoming view is that you can combine information from your calendars. A simple setting allows you to switch this functionality on. Et voilà, a complete picture of what is really going on in your life. The calendar items are read only, so you can’t edit them directly from within Things 3. However, I find this helps me avoid confusion between tasks (which can usually be put off) and appointments (which generally can’t). The fact that your appointments are present alongside your tasks transforms this view into something truly useful. In fact, I find myself using Upcoming as an alternative to my calendar app. The Anytime view shows you almost all the tasks which don’t have a date on them. I say almost: see the Someday view below, for the rest. Unlike the Upcoming view, which slices your tasks by date, Anytime dices them by Area or Project. I’ll talk about Areas and Projects shortly, but here you’ll see the top 3 tasks assigned to each of them. If you see any tasks sitting at the top of the view by themselves, this means they aren’t assigned anywhere at the moment. So far, I don’t tend to use this view very often, as I tend to go directly to the projects I want to review. However, it can give you a good overview of the different areas of your life, and help you pick up on any tasks that may have been forgotten. I suspect that Anytime might become more useful for monthly or quarterly reviews, because I have some important goals I want to achieve this year. While the goals themselves are time sensitive, the individual tasks are usually not. This is the dumping ground for all the other tasks left over. Taking another leaf from the GTD manual, Things 3 lets you move any task into this list. It’s still in your system, but on the back-burner. Someday represents ideas, possible future projects and pipe dreams you want to remember for later. Basically, it’s a space for anything you can’t work on right now. Things signifies this by turning the checkbox for Someday tasks into a faded, dotted outline. You can still check them off, if you want, just like any other task. Alternatively, if you realise you’re never going to get round to it, you can cancel the task, instead. The Logbook is a fancy way of saying, “here’s all your completed tasks”. It’s arranged chronologically, in a similar fashion to the Upcoming list, but simplified. Completed tasks have a small blue tick in the checkbox. Cancelled tasks have a cross, and the text describing the task is struck through. You can rescue any task you accidentally completed, by unticking it. It will immediately move back to the original list. That said, Things 3 features a full Undo option in the Edit menu, and a similar function on iOS. You’re therefore unlikely to visit the Logbook very much (a good thing). Since we are talking about a task manager app, this is where the real meat is. And I’m happy to say that Things 3 doesn’t disappoint. As elsewhere, tasks are simple but effective. When viewed in a list, you see a checkbox on the left, then the name of the task. Underneath the task is the project or area that it belongs to. To the right, you may see one or more icons. These indicate if the task has notes, a checklist, tags or a deadline. When you open up a task by tapping on it (or pressing Enter on Mac), it expands into an easy to read card format. On a new task, you’ll see the notes area, along with some icons in the bottom right: these allow you to add a date, tags, and so on. If you add a date, then the date icon will disappear, and you’ll see the date you chose on the left. If you want to change the date later, then you just click or tap on it. This may sound complicated, but in practice, it’s remarkably intuitive. You can complete a task by clicking the checkbox, or pressing the keyboard shortcut (CMD + .). And you can do this regardless of whether the card view is open, or not. Alternatively, you can right click on a task (tap and hold the checkbox on iOS) and choose to cancel it instead. I like the cancel function: without it, the only option is to complete the task or delete it. Neither of these is what actually happened, and you might want to keep a cancelled task around with some notes to explain why you couldn’t do it. It’s only a small thing, but it’s surprising how often the ability to cancel tasks is left out of task managers. So it’s good to see Cultured Code embracing this function. You may be noticing a pattern here. The more I’ve used the app, the more I’ve discovered that Cultured Code has an eye for detail. And it’s often in the small things that Things 3 excels. Speaking of which, there’s one area that Things 3 has absolutely nailed: dates. I can’t tell you how often I’ve been frustrated by dates in task managers. My introductory story, above, may give you some indication of how strongly I feel about it. Dates in Things 3 are start dates. In other words, they are simply when you would like to start working on a particular task. This is the main way of creating task schedules in the Upcoming list. And it is this date that is used to determine when a task will appear in Today. And for many people, it may be all that’s required. Picking dates is simplicity itself: click the date icon, or on iOS, swipe the task from left to right. The date picker pops up, with quick Today and Evening options at the top, plus a month calendar below. If the date you want is further into the future, just click the arrow and the calendar opens up further. As you scroll through, the individual dates fade into the background, while the month name appears. This simple animation enables quick selection, without loss of functionality. Incidentally, you can also use the date picker to assign tasks to Someday, as well as enter a reminder (see below). The way Things 3 interacts with dates means that tasks always go where you want them, when you want them. But you don’t have to keep it that way. If you find too many tasks creeping into your Today list, you simply move some to this evening, or a later date. And if you run out of time on today’s tasks, Things will simply keep them in the Today view, so they’ll be ready for you to look at tomorrow. Importantly, Things 3 will not flag those tasks as overdue, so there’s no psychological nagging from your task list. If you’re using Things 3 as it should be, checking inside every day, then dates will suffice for most time sensitive tasks. However, if you know you need to do a task at a particular time of day and you don’t want to miss it, then add a reminder. You add reminders on the same screen you enter a date. Just tap the reminder option and set a time. The reminder will show up at that time on whichever device you are using. Reminders added on Mac will show up on iPhone, and vice versa. Deadlines are for the few occasions that a task must be completed by a specific date. For example, buying a birthday present. You set deadlines in a similar way to the date picker, but here you will always pick dates in the future. A task with a deadline on it will be shown with a little flag, and a countdown of the number of days to go. Even here, little details count, with the display changing to say “tomorrow”, as the day approaches. When a deadline has passed, Things 3 will flag the task as overdue, and its flag will turn red. I love how these different dates interact with each other and it means I can plan things well in advance. I’d set a deadline for the birthday itself, because I mustn’t miss it, and it’s helpful having the countdown. But I don’t want to have to think about a July birthday, when it’s only the middle of January. Instead, I set a (start) date a couple of weeks before the deadline. This will give me time for researching, buying the present, and wrapping it. Now, I can safely forget all about buying this present. I can focus on what needs doing today, safe in the knowledge that the task will surface only when I need it to. Tasks can be set to repeat on a regular basis. Thankfully, Things 3 embraces both schools and displays a slightly different dialog, depending on which type you choose. You can also say up front whether you’d like reminders or deadlines on each repeated task. Through these choices, you can pick pretty much any schedule you can think of. I tend towards the simplistic side of the spectrum, but I’ve yet to find a combination that isn’t accounted for. The one chink in Things 3’s armour, is that it took me a while to find out how to make a task repeat. Open the task, so the task details are displayed. Select Repeat, enter the options and you’re good to go. Later, I realised there is a menu option on Mac. But who thinks to use menus, when we’re used to apps doing everything through the interface? *FYI, the 3 dots icon also gives access to “advanced” options, where you can duplicate or share a task, and convert it into a project. I don’t know if it’s just me, but this icon seems a little misleading for what it actually does. Still, it’s a very small misstep in what is otherwise a great app. Checklists are a way of breaking down a task into smaller steps. Click the checklist icon and the first step is added for you, with the cursor positioned next to it. Type your first entry, then press return to add another. Rinse and repeat for as many as you need. You can reorder and tick/untick checklist items in exactly the same way as tasks. The only thing you can’t do is add dates, tags, and so on. Just tap the 3 dots icon and choose convert to project. Things will take the task name as the name of the project, and the checklist items become individual tasks inside. Sometimes, I start with a checklist but soon realise there’s too many items. Other times, I know a project is coming up, but don’t want to get too formal with it yet. I simply start a task to brainstorm the first few steps. Then, when I’m ready for action, I convert it to a full blown project. As you’ll have gathered by now, Things 3 is in the main, designed around the GTD task management process. However, one of the (many) things I like about Things 3 is that it doesn’t tie you to any particular system. If you want to follow GTD, you can, but if you want to do something else, Things gets out of your way. GTD purists might balk at that. Further, they may be shocked to hear that the one thing that seems to be missing from Things 3, is contexts. A context is a place or resource that is required for a task to be worked on. A context might be as specific as “mobile”, for when you need to make a phone call. It could be as general as being at “home” or in the “office”. The way it’s supposed to work in a task manager app, is that you assign a context to each task. Then, when you look at your list for today, you filter it by your current context. That way, you get to focus on only those tasks that are relevant right now. After all, it’s no good looking at a list of household chores, when you’re sitting at work. Tags are as close as Things 3 gets to GTD style contexts. If you want, you can add tags to all your tasks, and use them in just such a way. Things 3 will display a list of available tags at the top of any of its lists. Just click the tag, and Things 3 will happily filter the list. Personally, I’ve never really got the hang of contexts. I understand the concept, but whenever I’ve tried to use them they either don’t make sense for my life, or they quickly get out of hand. I end up with so many contexts that it takes me too long deciding which one to use. Or, I try to add contexts to every single task and spend more time organising, than actually doing. IMO, our modern day connected workforce means that contexts are less relevant. In some cases, such as remote working, they’ve been rendered pretty much obsolete. I do use one or two tags in Things 3, but not always as contexts. In practice, I mostly stick to using Areas or Projects (I’ll get to them in a minute). I use some projects to represent my longer term goals. So far, we’ve discovered a lot of functionality in Things 3. Much of it is wrapped up in the built in lists, tasks and their constituent parts. You can create your own lists, beyond the built in ones. These are known as Areas and Projects. Areas and projects are like higher level “folders” to contain your tasks. Together, they provide a different perspective on your lists. But they also work seamlessly with the standard views. Areas are shorthand for “areas of responsibility”. They represent the different hats you wear in your life. You can have as many or as few as you like, although I generally find that less is more. I currently have “home”, “work”, “personal”, “church” and “writing”. Areas are just like folders, and can contain both tasks and projects. The main use of Areas is to break up long task lists into smaller ones, so you can review them more easily. Projects may be used by themselves, or can sit below an Area. They are easiest to define as a set of tasks that together accomplish a particular outcome, e.g. “decorate the bedroom”. I’m using projects for all my major goals this year. And I keep my goal projects separate to Areas, so they stay front and centre, just below the main Things 3 lists. You can add, edit and rearrange tasks inside a project, in the same way as in any other Things 3 list. However, projects have a few extra bells and whistles. Projects automatically get a checkmark next to them, once all the tasks inside are completed. They also have a little “pie chart” next to the project name, to show you how far you’ve got with the tasks inside. This gives you an idea of how you’re doing, without having to open up each and every project from the main screen. You can set start dates, deadlines and reminders on projects, just as you can on individual tasks. This means that you can defer a project until you really need it. The unique feature of projects in Things 3 is that you can add headings. Unusually, on iPad, you add headings to a project in the top right view menu, not in the project menu itself. On Mac, the option is at the bottom of the screen instead. Compared to the rest of the interface, this feels slightly counterintuitive. However, headings are an excellent addition to an already solid app. One thing a multi platform app must do, is ensure its data stays current on each one. This is another area where many task managers seem to fall down. You set up sync by switching on Things Cloud in the app and registering an account. It’s painless and quick to setup. And once it’s running on one device, it’s a doddle to switch on elsewhere. Sync works extremely well, taking just a couple of seconds or so, to catch up. I only notice sync happening if I have made lots of changes in one app, and then switch to a different platform. Strangely, the more tasks I have thrown at it, the quicker it seems to have become! Several times, I’ve opened Things 3 on iPad, following some edits on iPhone, and noticed it’s already up to date. Things 3 features universal search, which you can access on iPhone by swiping down to reveal the search bar. Search works on all three platforms, but really comes into its own on Mac. In common with many other apps on the Mac, you can press CMD + F to start a search in Things 3. Things will find lists, projects, or individual tasks and allow you to change to any of them instantly. If you are looking for a task, Things 3 will take you directly to the relevant list. The task is then highlighted briefly, so you can see it in context. This makes it incredibly easy to find anything. Suffice it to say, that search has become my default method of navigation. Of course, it’s not just the features and interface that make a winning app, but the support that goes with it. The online help pages are reasonably clear: there isn’t masses of information present, but the most important questions are answered. A contact form is available on the website and I used it to report a couple of minor bugs. The first reply (after the ubiquitous “it’s in the queue”message) was several days later, although they did apologise for the delay. They did however, email me again a few days later, to say they had fixed one of the bugs and it would be in the next release. So not brilliant in terms of initial support. But fairly snappy for developer response. I would like to have seen a dedicated email address or ticketing system for paying customers. Other than some minor inconsistencies in the interface, some of which I already mentioned, there’s not much bad to say about Things 3. Of course, the elephant in the room is that Things 3 is Apple only. Cultured Code say they like native code and I get that. But the absence of even a web app means I couldn’t recommend it at my workplace. If you’re already firmly embedded in the Apple ecosystem, then it would be hard not to recommend Things to you. But if you are Windows based, or only have an iPhone, then I’d say look elsewhere. This is a shame, because Things 3 is so great at what it does. I’d love to see what Cultured Code could do with a Windows/web version. Speaking of which, there’s a lot I’d like to see in future releases. Quick Inbox option to add multiple tasks at once, one per line. Ability to set “evening” in advance, for future dates. Errands or Lunchtime section, in addition to Evening. Support for multi-markdown in notes. Weekly and quarterly reviews built in to the app. Keyboard shortcut for adding tags. Extend natural language to task creation, not just dates. Better integration with Evernote and other tools. Display of other tasks happening on a day when I schedule a task. Automatic dates added to notes (Nozbe has separate dated sections for each note within a task). Better import options, particularly from plain text, that doesn’t rely on Apple scripts. Sorting and filtering of the logbook. Please don’t misunderstand me: these ideas are not complaints, but a mark of great software. I can see how good Things 3 is and it’s an absolute pleasure to use. So I naturally want to help improve it! I always like to evaluate hardware and software for its ergonomic benefits, or otherwise, and Things 3 does not disappoint. It’s superb from an ergonomic standpoint, both on Mac and on iOS. The extensive keyboard support on the Mac, coupled with design features such as instant search, is second to none. Nearly all actions, from navigation, to task entry and updates, can be achieved without recourse to the mouse. On iOS, we have a similar picture. Intelligent use of gestures, plus intuitive drag and drop, make Things 3 a cut above any other app I have come across. I understand the parity of prices between the US and UK is due to the vagaries of the app store, and VAT within the EU. There is also the issue of the lack of a universal app for iOS, which would make Things 3 more appealing for many. Cultured Code defend this position by saying that not everyone has an iPad, and the price reflects extra features not present on the iPhone. I get where they’re coming from, but I’m sure it will be an irritation for some. Despite this, I think Things 3 is still a great deal on both iPad and iPhone. With the Mac version, I’m not so sure. What do you get with the Mac app, that you don’t on iOS? The interface looks the same, so it would be easy to assume there’s not much difference. However, integration with other apps is better, functions like copy/paste will always be better on a Mac, and the keyboard support is awesome. Even with these abilities, I think I would be hard pressed to sink nearly £50 into it. It’s a tricky one. Personally, I’d feel a lot more comfortable recommending it, if they dropped the price of the Mac app by £10-15. I think they could justify the Mac app cost much better, if they threw in a web interface. I for one would then be able to use Things 3 at the office, a Windows only environment. That said, for those like me who don’t want to pay a subscription, Things 3 compares very favourably with competitors like Nozbe. Many of them would have you paying more across the years, for less functionality. If I started with the iOS editions, I’m not sure I would have shelled out for the Mac app, but now I have it, I don’t want to give it up! Things 3 Review: Should you buy it? So what is a prospective customer to do? If you just want to try it out, then by all means start with the Mac trial version. You can set it up to sync with Things Cloud, so if you later ditched it, but bought one of the iOS versions, you’d still have all your tasks to hand. Otherwise, I’d recommend starting on iPhone, as it’s the smallest investment. You’re also more likely to carry it with you. This will give you a feel for the app, while you begin adding tasks, so you can decide if you like it. Then, once you’ve got a few projects under your belt, plump for the iPad edition. Hopefully, this will give you all you need, without making a hole in your wallet. 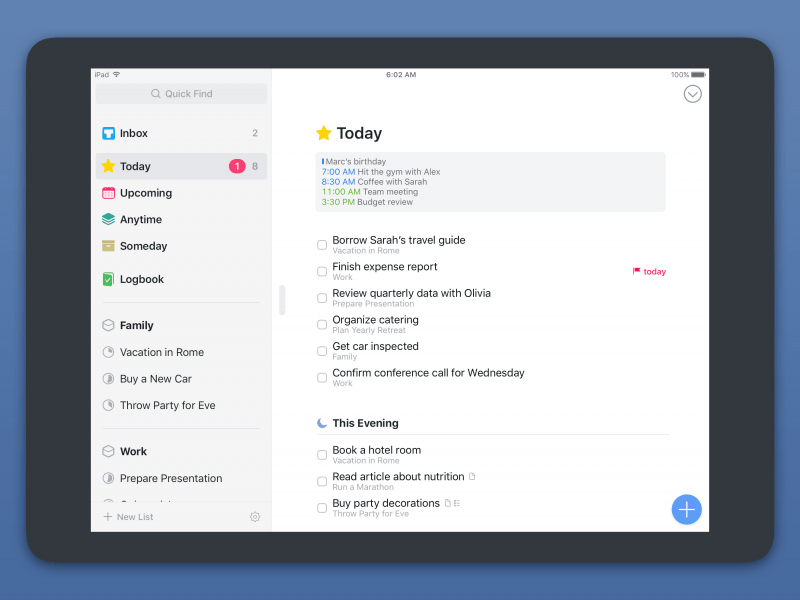 Things 3 is a beautifully designed, ergonomic task manager for Mac, iPad and iPhone. Cultured Code have successfully leveraged the benefits of each platform, to provide a fully integrated, productivity dream for individuals. But if you want to share tasks with your team, you’d best look elsewhere. However, what Things 3 does, it does better than pretty much anything else out there. If you’re tired of searching for the perfect task manager, you won’t find it, but Things 3 comes awfully close. Finally, a task manager that gets dates right!